Many online stores produce regular newsletters. It’s a chance to talk about up-and-coming promotions, push new products, and offer some useful advice to your customers. However, whilst newsletters are a helpful promotional tool, unless you have an extensive email marketing list, you may not see results. 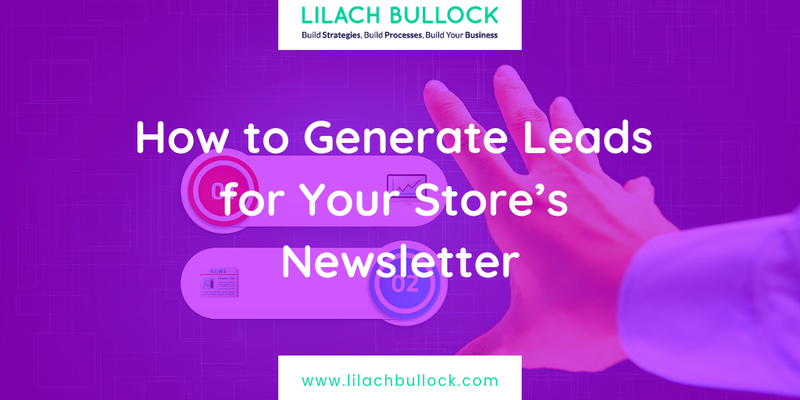 It isn’t easy generating leads for an online store’s newsletter, but if you follow the tips below, you could save yourself a lot of time, effort, and tears. There are hundreds of ways to generate leads and none of them involves much effort. First, your website needs to be optimized to encourage customers to hand over their email address. The trick is to harvest email addresses without creating a negative user experience. Google frowns upon a poor UX, so avoid irritating pop-ups that disrupt your customer’s visit. Bear in mind that customers dislike handing over their email address. The rise of spam has made most of us extremely protective of our cyber privacy. It is tedious and time-consuming sifting through hundreds of spam emails, so most people will only leave an email address if there is something in it for them. You need a newsletter sign-up form on your website. Make it enticing and attractive to customers. Whet their appetite with interesting content, exclusive offers, and great photos. If your newsletter looks boring, nobody is going to want to read it. We all love something for nothing. Create a gated area on your website where customers can access special content, Black Friday deals, or anything of “value”. In return, they agree to subscribe to your newsletter. Customers expect something of value when they give you their email address. Common strategies include a discount code, an online magazine, or the option to open a customer account and save time on future orders. In general, pop-ups should be avoided, but they are a useful way of harvesting email addresses. Sidebar forms encouraging customers to sign up for a newsletter are easy to ignore – and most people will do just that – but if you introduce a pop-up window when your customers are browsing the site, around 3% of visitors will sign up. However, keep it simple to avoid annoying customers. A quick “sign up or leave this page now” form is perfect. Social media is a powerful marketing tool. Most people use social media, so make the most of this great opportunity to harvest email leads. Include a newsletter sign-up form on your social media page. Email management software providers such as Mail Chimp include tools to make this nice and easy, but if you need help with an email marketing campaign via social media, contact an expert such as Eventige. Social media contests work well, but you need to give people a reason to subscribe. Freebies, special offers, discount codes and gift cards are all proven techniques to persuade people to enter a competition and hand over their email address. Never abuse a customer’s email address. Ideally, they will love your newsletter, but always make it easy for them to unsubscribe if they choose. The income is in the list! The long-term income, I would say. If you are building an ecommerce business or any type of business, you definitely want to build an email list. I’ve found social media to be a great place to capture leads for your ecommerce store. You can target a very specific audience with Facebook, for instance. Instagram is also another great social media platform that works well for the ecommerce market.